Old Age: What's the Big Deal? In the lead-up to my 70th birthday in December, I’ve been playing with the idea of declaring myself old. This is my way of getting used to the idea. After all, at some point I have to own my age, and ‘old’ is just a word, isn’t it? I know there are many people of advanced years who don’t want to own up to their age. 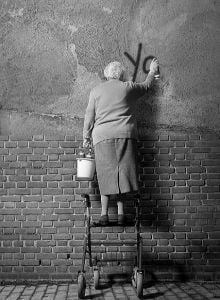 For the most part in our society, old has a pejorative connotation. Middle aged isn’t so bad. Being called a senior is still on the soft side. But old is, well, old. I had a lovely woman come to my yoga class this week for the first time. She announced that she is 87 years old. Her daughter who is a regular student of mine brought her along because she knew that yoga could foster mum’s general well being. From the beginning of the class to the end, mum exhibited a great can-do spirit. Yet when I praised her at the finish of the session, she said, ‘What’s the point of doing yoga when I’m so old?’ I hoped that she could get enthusiastic about the benefits of yoga for her age – really for any age. Because she had had a bad fall a couple of years ago, gaining more strength and better balance, for instance, would be invaluable advantages for her. Yoga is an amazing tool box that gives a measure of control over so many aspects of the ageing process. Let me wax lyrically. Yoga fosters normal breathing even as your vital lung capacity is decreasing. It keeps you supple and able to move with relative freedom. It keeps your body’s systems – circulatory, digestive, nervous, for example – working efficiently. It promotes tone and function of internal organs. Best of all are the mental, emotional and spiritual benefits of yoga that derive from learning the art of relaxing and meditating. And there’s so much more! I feel blessed by good health at this stage of my life, and that has reduced my concerns about ageing. At the same time, I know that my condition could change any time, possibly in the blink of an eye. So, I don’t take my health for granted. A wonderfully irreverent comedian named George Carlin had some things to say about ageing. He passed away in 2008 and bequeathed us some simple notions about how to enjoy the process of growing old. Throw out nonessential numbers. This includes age, weight and height. Let the doctors worry about them. That’s why you pay them. Keep learning. Learn about the computer, crafts, gardening…. Never let the brain idle. Laugh often, long and loud. Let tears happen. Endure, grieve and move on. The only person who is with us our entire life is ourselves. Be alive while you are alive. Surround yourself with what you love whether it’s family, pets, keepsakes, music plants, hobbies…. Your home is your refuge. Don’t take guilt trips. Take a trip to the mall, even to the next country, to a foreign county, but not to where guilt is. Cherish your health. If it is good, preserve it. If it is unstable, improve it. If it is beyond what you can improve, get help. Keep encouraging the oldies in your life to come to a yoga class. Even though you’ve extended invitations before, don’t give up. Yoga really is for everyone.